This Valentine’s day, Get creative and offer something different and share with your loved ones. Manoucher Valentine dessert Manoucher rectangle Pizza Crust Hazelnut and Chocolate spread Sliced Strawberries Almond shavings Lightly dust with Icing sugar Enjoy a Delicious Valentine’s day!!! We have two new innovative products on feature at the LUNCH show in London, UK. 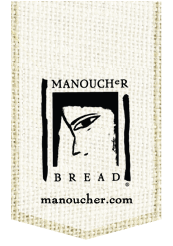 Come see for yourself, and taste the burst of flavours that come through our all natural, freshly handcrafted bread. Hosting a thanksgiving dinner doesn’t need to be stressful. Thanks to ‘Mise en Place’ aka ‘putting in place’, you can save yourself valuable time and keep your cool on the big day.